It is useless, has been for 90 years. Bloede Dam is situated on the Patapsco River and sits in the way of the more modern conservation efforts now laser-focused on our waterways and bay. "We've completed a feasibility study and then in addition to that we are in the design phase for the removal." Bloede Dam will be no more sometime in 2016. Mary Andrews with the National Oceanic and Atmospheric Administration says it will be done partly with explosives but mostly by dismantling, all of it designed to restore the Patapsco. Bloede Dam used to have a purpose. Built in 1906, it was a revolutionary design housing the turbines in the wall that powered both Catonsville and parts of Baltimore. "It was a very unique dam design for the time, however because the turbines were inside the dam, water could no longer flow into the turbines with sediment coming down the river," Andrews said. While a new idea at the time, not a good one. Bloede Dam provided power for less than 20 years and has been shuttered for nearly a century now. It has been nothing more than a waterfall, a relic claiming lives at an alarming rate. This past Fourth of July, 27-year-old Alvaro Ordonez of Cheverly was pulled from the water a day after jumping. He drowned, pulled down by the force of the water near the dam. "We've had three people pass away in the waters here below this damn. I believe in the last four years." Ranger Rob Dyke is the Park Manager of the Patapsco Valley State Park and has to keep a close eye on the part or the river near the dam. Despite plenty of signs, people will swim in the area of this old dam and even use it as a water slide off the top. "There is an undertow and there are rocks, so when people jump or slide off of there, you don't know what is under the surface of the water," Dyke said. 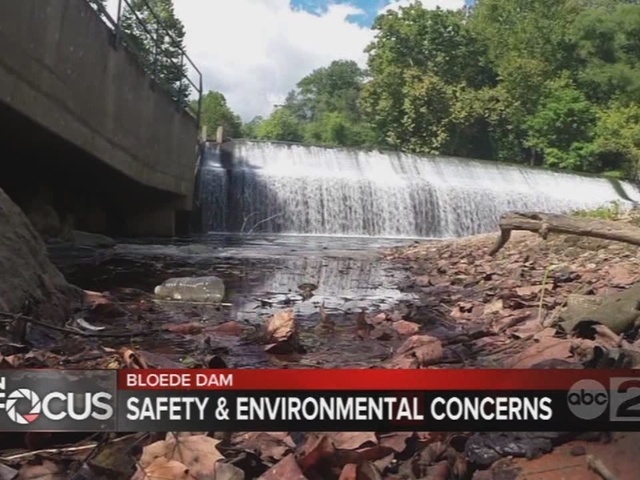 Bloede Dam is not only a danger to swimmers using the park. Migratory fish populations have fallen to critical lows over the years despite fish ladders the Department of Natural Resources built back in the 1990s. "Of all the ladders in the state, this is by far the worst one to keep open." Jim Thompson is a biologist for the state's fisheries service and maintains the fish ladder, a long tunnel contraption built to pass migratory fish, a population environmentalists argue is crucial to bay health. But between protective screens falling off into the water and debris that clogs the entrance, Thompson says it is rarely effective in getting fish up past the first of four dams in the Patapsco to spawn up river. "It does pass fish. It has passed some resident fish, but it is not passing the fish we built it for, which is mainly Herring and Hickory Shad. It means these fish are below the dam, but they can’t use it. They are not using the ladder," Thompson said. With the dam removed, both fish and people would have safe passage in a peaceful and whispering river flowing undisturbed from Ellicott City to the Chesapeake. Serena McClain is the Director of River Restoration at American Rivers, a nonprofit helping to lead the charge in dam removal along the Patapsco. Standing on the banks of the river near where the Simpkins Dam once stood, she points out what Bloede could look like. Simpkins Dam, up river from Bloede, was removed in 2011. I was built in the 1800s to help power a textile mill called Thistle Mill. It was removed in part with federal funding that began in late 2010. Union Dam further up river was done quite the same way in 2009. Next up will be Bloede, it being the first and largest along the river. It is the lynch pin to any ecological restoration. "It is going to be a really exciting day. I am overly emotional and overly sensitive. I tend to get teary at these kinds of things, but whatever. It's cool enough. I'm gonna own it," McClain said. But for some, the effort to restore the river is rushing too fast. Lisa Wingate is a historic preservationist arguing the state slow down before pulling out all four dams. Three of the four were built in the early 1800s to power old textile mills and are often considered the last thing standing signifying the Patapsco Valley's crucial role in the American Industrial Revolution. The more than century-old dams powered mills and provided work which required housing and built the first communities along the river. A history all but washed away these days. Wingate doesn't feel that history should keep structures like Daniels Dam near Ellicott City in place, but should be documented for education about who we are and when we settled. "It is a shame to have everything obliterated without making any kind of permanent record of it, without having documentation, without having physical remains to refer to," Wingate said. Now removed, only parts of the structures’ foundation remain. There’s no mention of the settlement that once stood there and its role in the industrial revolution. That is a mistake Wingate is fighting to avoid with Bloede Dam, arguing to at least keep a small part of the dam erected as a nod to our past and the engineering of the time. It’s a design the river restoration effort might just slow enough to accommodate. "We want to make sure when future visitors come to the Bloede Dam, they'll see signage or cool ways to kind of interpret what was there. …They will still have the ability to learn about the settlement of this region and the industrial revolution and what that actually meant," McClain said. That design will likely be discussed next month at a design meeting along with sketching up plans for the demolition. In the fall of 2015, a Baltimore County sewage pipe that runs along the dam will be moved, clearing the way for dam demolition in 2016. Daniels Dam, the northern most structure near Ellicott City would be the fourth and final dam to be removed, but it has yet to be funded and studied.